There is nowhere more perfect for a family photo shoot than your own castle. A family photography shoot at home, opens up hundreds possibilities. However the main advantage of shooting at home is that I come to you. Have you ever tried to leave the house with small children. Remember those child free days when you could decide you were going to leave the house. You grabbed a coat, looked for your keys and walked out the door. Ahh memories. Now when im trying to rally the troops it takes a good hour to build up the momentum to leave the house. No one likes to be hurried…. ever! Michael McIntyre did a skit on leaving the house and i swear he must have been peering through my window. Ive added the link at the bottom of the blog in case you’ve never seen it. So we have established leaving the house isn’t going to be a drama. 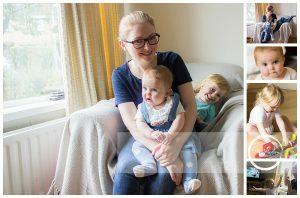 The next reason your family photography shoot at home will be a success is everyone is relaxed. Kids love being at home. When the little Hudsons come home from school i can see how they instantly relax. Shoulders drop, everything gets dropped at their feet. Straight to the fridge for a cold drink. Biscuit or pancake enroute to the TV. Then they breathe, big deep, happy relaxed breaths. Im like that too, driving down my road I can see Belfast Lough. I love that sight, ive seen Belfast Lough my entire life. Its always been infront of me. Its home. Last February I was asked to document the life of a brand new human. I was nervous. The pressure to provide beautiful images this little family could treasure was immense. All put on by myself might i add. This little family couldn’t have been more welcoming. They opened their door with a smile. Lifestyle Photography or Documentary Photography is a beautiful way to capture family life. Those moments that we are living here and now are the moments we should never forget. Its lovely to capture the picture perfect smiles for the wall. However family albums I believe should be filled with the nitty gritty moments. The images should show the real moments in life. When i do a photo shoot at home, those are the moments im searching for. 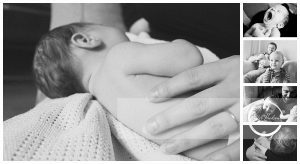 What i aim to capture at a newborn family photo shoot is the small details. Newborns grow so quickly and change so fast. You think you will remember them being this small. However trust me, when i look at my 11 year old son, i struggle to remember those quiet moments. Its always a bonus when i capture a yawn. Who doesn’t love a newborn baby yawn. Blissful moments right there. I have a big passion for Lifestyle Photography and being able to shoot in your home is a brilliant experience. The camera never lies, have you ever heard this expression. Its right, the camera will capture everything. From the tiny pimple that appeared last night. The grey hair. Extra baby weight that has taken up camp on your body. However I never see these things. When i have a family in front of me, im looking for the joy. Keeping a careful watch on expressions that are familiar to each other. Then i snap. Joyful family moments amongst the noise of life, those are the memories to cherish. I must have done something right because the little family invited me back when baby girl was 6 months old. Big brother remembered me and was waiting and watching from the window. He calls me Melody, I LOVE him so hard. We had so much fun with this photo shoot at home. I brought bubbles, well you would have thought id brought the moon!!! Joyful moments at home, right there, bam! These little memories have stayed with little man, he remembers me. When he sees me and my camera he gets excited. How clever is this 3 year old, i tell ya. Perfection. Relaxed, chilled and organic this is how i would describe my shoots at home. Children love to show me their treasures and get even more excited if they see me take a picture with them. Their attention span is so brief I need to be flexible and interact. Its so enjoyable, honestly. I couldn’t believe it, how quickly a year passes. 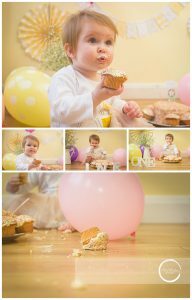 When i look at the images i captured when she was so little, I get emotional. She was so little and here she is walking, munching on a cake. Bossing her brother around like she’s been on this earth for years. The Cake Smash was at home, everyone was relaxed. Baby girl was super chilled being in her own environment. I have taken Cake Smash sessions in all matter of homes, gardens, parks. Space is never an issue, so dont be thinking oh ive no room. We can make it work. Look at the size of your little person. Then look at the size of the cake. How much room do you need seriously? I will recommend a family photography shoot at home until im blue in the face. They work so well, and they provide the most interesting of albums. They document your treasures. I love looking through images i took growing up. Seeing the brown patchwork sofa my gorgeous mum adored. The wallpaper that would make her cringe now. These are moments from my life and i love looking back at them.